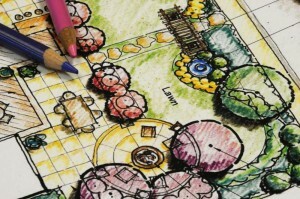 Planting plans are used to show the detail of planting within a design. Unless the garden is very small, the garden designer will usually produce a separate planting plan for each border and key area of the design. and tree to use when producing their plans, rather than trying to calculate the exact area covered for each species. For example: small, medium and large herbaceous plant, small, medium and large shrub, and small, medium and large tree. Smaller plants are typically planted in groups of three, five or seven, as an individual plant may be too small to have real visual impact. In some cases, if the design includes very little planting, it may not be necessary to produce a planting plan at all. The deciding factor should be whether the planting can be shown clearly on the main plan (as may be the case, for example, if the design is mainly hard landscaping and includes only a few specimen plants) or whether a separate plan is required to show details. There are many different ways of producing a planting plan.